Almost every facet of our existence is now subject to government and corporate surveillance and data mining systems. To them, we exist only as sets of quantified information — not as living beings. RENDER is a depiction of human personhood under the reifying gaze of this new panopticon. 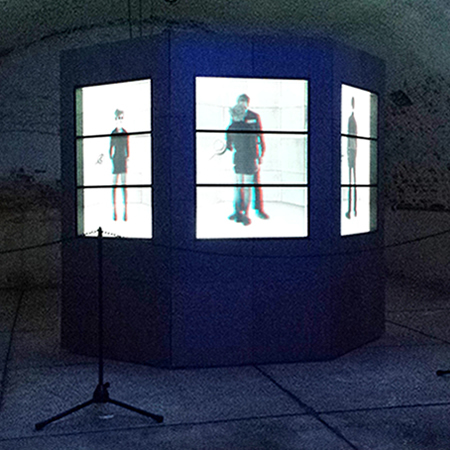 On each of the 3 screens built into the vault-like structure, images of a woman and a man appear in stereoscopic 3D. As they are analyzed from all angles, their individual selves, and their relationship, are rendered into abstract numeric values by the omniscient surveillance apparatus. Finally, they lose their depth and dissolve into flat, pixelated grids of pure information. The data becomes the primary reality, and the people from whom it has been extracted disappear from view. We are left with a question: Can the private self endure in this new age, or are we all just ghosts in the machine? RENDER was developed during a summer 2015 residency at the Center for the Holographic Arts. It went on view for the first time in completed form at the 2015 Governors Island Art Fair, every weekend in September, inside the ammunition magazine of historic Fort Jay.